djchrismac wrote: It's about the only explanation I can come up with, them being a key code or marker. Watched the documentary yesterday, very good. Iceland seems like a fascinating country. A couple of guys on the radio a few days ago were laughing and joking about the Icelandic believing in Elves and Fairies. They were ridiculing the fact that they factor them into any planning permission. It is saddening me to think all this fascinating information is being passed of as a myth. There was a triskellion key in the TV show Merlin, although I never watched it so I don't know what it actually did! Thomas Sheridan has some very good refs to the symbols and the surrounding research very much inline with this topic.Do check out his other work. The true meaning and purpose of mythology. Our pathological tendency to regard our ancient ancestors as inferior. The power of symbolism to preserve and transmit archetypal ideas down the ages. Do the stones of sacred megalithic sites possess special electromagnetic properties? Does stone have a memory? The effects of modern architecture on the human psyche. Can radio waves and others beyond the spectrum of our five senses allow access to a spirit world? From Atlantis to alchemy, you will never see history in the same way again. Gopi at AQ presented the history that connected the dots for me ..thanks Gopi! a simple 90 degree horizontal view or perspective and the collider (temple) and the recent rituals begin to make the program[s] intent more visible. trippingthelight wrote: There was a triskellion key in the TV show Merlin, although I never watched it so I don't know what it actually did! I've not watched Merlin but may check it out although I suspect it will just frustrate and annoy me, as does 99% of TV. Knowing our true history and then reading folklore and mythology from a different perspective is much more rewarding than any drama peddling (almost always) the official, inaccurate version of "history". I will admit to having a nature documentary on in the background just now, for the relaxing animal/narration soundtrack, on a channel with no adverts. That's about the 1% that doesn't annoy me. Andrew wrote: I saw a Dream catcher at work the other day and noticed the spatial pattern. It isn't precisely sacred geometry, but I'm guessing they have been passed down throughout history for actually being effective in altering bioenergetic fields. Keeping bad spirits away by... bringing order to a room? Dream catchers are based on the phyllotaxis (the criss-crossing spiral patterns of flowers and leaves). Flowers exist at the junction between space and counterspace, so they are like a living connection between the Realms. (Might want to contact AnAncientAwakening as he is studying this relationship right now, in regards to herbals). 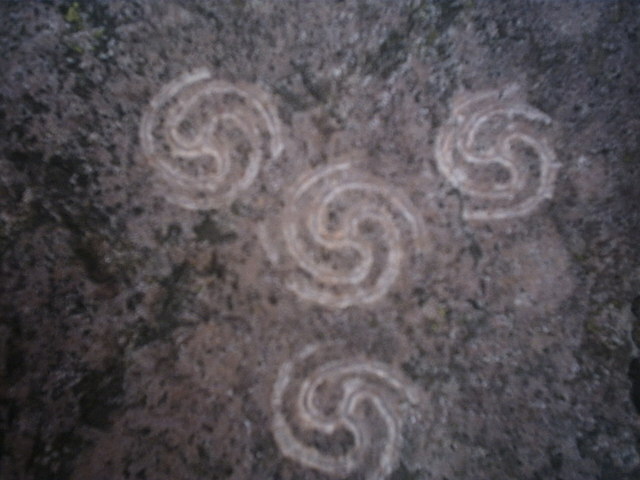 Andrew wrote: What about runes? Do they work in the same manner? I have a fair understanding of Elder Futhark. Andrew wrote: Since these are all spatial structures affecting the cosmic sector, it seems they do "magickally" affect circumstances and probabilities without any kind of power source or magickal charge, like Reiki for instance. Actually, these spiral patterns occur when space and equivalent space (the effect time has on space) intersect... space is linear and equivalent space is angular, so you end up with spirals, coils and vortices. Physically creating them does not infer any magical function, as you are just doing 2D/3D spatial manipulation. You have to either set up the environment to create them (like planting a flower garden, or placing rocks in a stream), or invest qi or shen into the system to activate it. 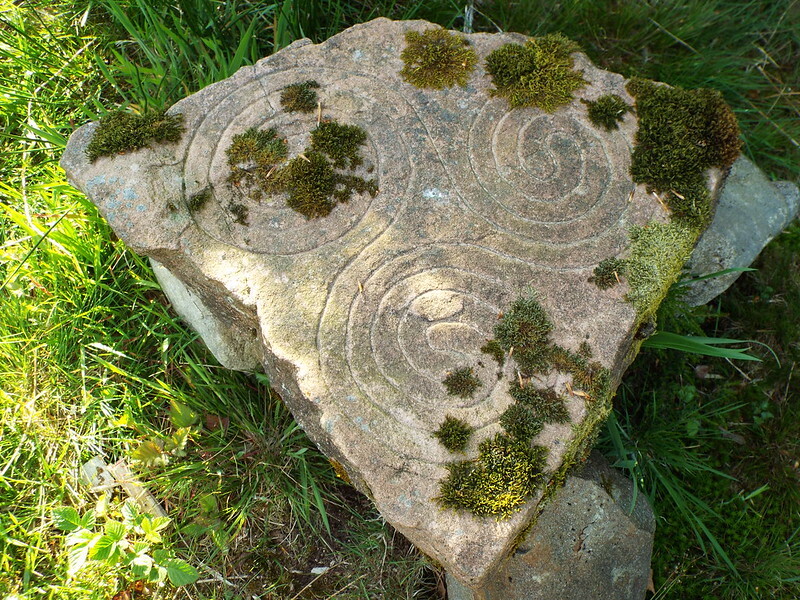 So stones with spirals, cup and ring marks could perhaps be a leftover of an intersection between space and equivalent space, much like the seashells of the Lochranza LM, leaving a mark when making the transition, be it on sand, grass or stone?